Looking to turbo-charge a writing unit? 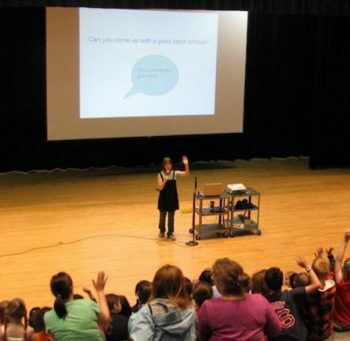 Want to inspire an auditorium full of kids to create their own stories? Invite me for an author school visit or library visit! Browse my ready-made workshops and presentations below, or request a custom workshop or presentation. To inquire about fees and schedule a visit, please get in touch. All writers rely on tools and tricks to help them create good stories. In this dynamic presentation, you’ll learn the 10 things that have helped me most as a writer. If you’re interested in becoming a writer, these things can help you, too! Learn how Behold! A Baby was created, from initial brainstorm to finished book. In this highly visual presentation, I show each step of the process, including my rough drafts, editing the text, as well as Joy Ang’s initial sketches and final artwork. Followed by a Q&A. To grab readers’ attention and keep them hooked till the last page, your story needs high stakes. In this workshop, we’ll do fun group activities and writing exercises to practice upping the ante. Do you ever sit down to start a story and find yourself staring at the blank page? Writing prompts, also known as story starters, can be a great way to get the ball rolling. As a group, we’ll create Story Jars–writing prompt tools that can remain in the classroom for future use. 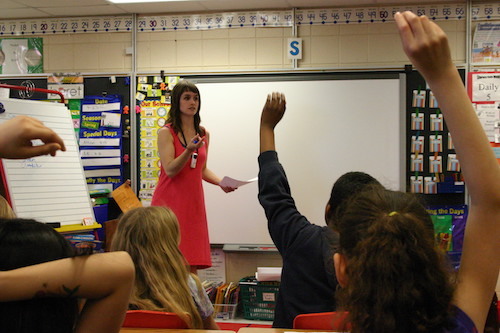 Want to schedule a school visit? Have a general question or comment? I’d love to hear from you.